Colorectal carcinoma is one of the most prevalent types of cancer in the United States. Xenograft murine models closely mimic human colorectal tumor aiding in the development of innovative cancer therapeutics. The LS 174T cell line was isolated from a Duke’s type B colorectal adenocarcinoma of a 58-year-old Caucasian female patient. Frequently used for biomedical research related to colon cancer, LS 174T cells are positive for the expression of various oncogenes, including c-myc, N-myc, H-ras, N-ras, Myb, and fos. Also, the LS 174T cell line possesses abundant microvilli and vacuoles and produces carcinoembryonic antigen (CEA), interleukin 10 (IL-10), interleukin 6 (IL-6) and mucin. LS174T cells provide suitable in vitro and xenograft models for studying mucin expression in colorectal cancer such as in the 1989 study by Siddigui et al. that identified differences in biosynthetic and structural makeup differences between xenograft mucin secretion, as there are cancer-associated antigens carried by secreted mucin glycoproteins that hold potential for cancer-specific drug targeting. Another example study that uses LS174T cells is the 2006 Cancer Research study (Chen et al.) that studied novel synthesized angiogenesis inhibitors, particularly VEGF inhibitors, on colon cancer. YN968D1 is one such compound that demonstrated inhibition of protein tyrosine kinase (PTK), VEGFr2, Ret, c-SRC and c-Kit and exhibited excellent dose response antitumor activity. YN968D1 was proposed as a replacement for the Phase III drug Novartis as it has a similar but improved mechanism of action. A study by Zou et al. (2010) used LS174T cells to develop a novel imaging technique that uses a radiolabeled complimentary determining region-grafted humanized CH2 domain deleted anti-tumor associated glycoprotein-72 (HuCC49deltaCH2) monoclonal antibody as a method for cancer-specific imaging using 18F-fluorodeoxyglucose positron emission tomography. The study was a success and concluded that this method of antigen-directed specificity for cancer imaging holds potential for clinical therapy design, especially for pre-, intra- and postoperative PET imaging. Finally, a 2011 study used LS174 colon cancer cells to investigate the contribution of c-Jun N-terminal kinase (JNK) signaling to rapamycin resistance. Results showed that JNK activation/phosphorylation increased with rapamycin treatment and that its downregulation and inhibition enhanced the antiproliferative effects of rapamycin, indicating that combination therapy of rapamycin with a JNK inhibitor may improve clinical outcomes. The LS174T cell line is used to create the CDX (Cell Line Derived Xenograft) LS174T xenograft mouse model. 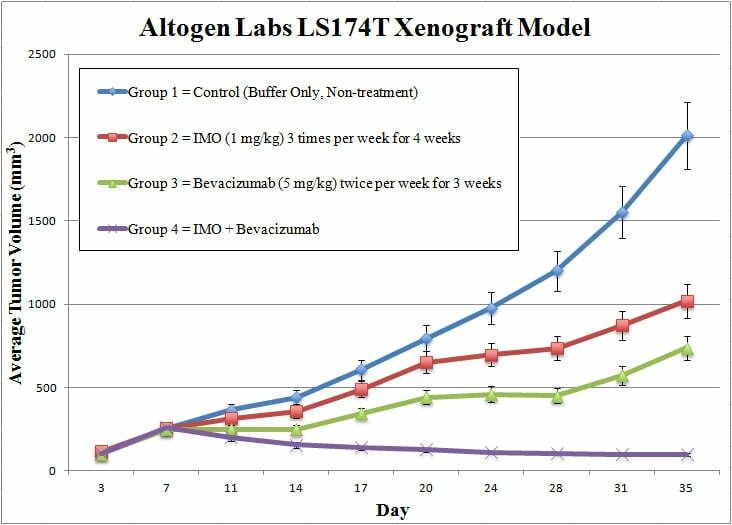 The LS174T xenograft model can be utilized to study monotherapies (e.g. RNAi specific siRNAs/miRNAs) or to determine synergistic efficacy due to resistance (i.e. bevacizumab and immune modulatory oligonucleotide TLR9 activation). Cells are collected and viability is determined. Trypan blue is utilized and a 98% minimum viability is required for study initiation. Each mouse (NOD/SCID or BALB/C athymic, 10-12 weeks old) receive a single s.c. injection. One million cells is injected into the flank of a hind leg (volume of 100 µL) of the Matrigel cell suspension. Tumors are then measured with digital calipers. An average size of 50-150 mm3are needed to begin the study. Animals are then sorted into groupings that best represent randomization. Compounds are administered following the treatment program. On-study measurements include tumor volume and mouse weights. A necropsy is performed at the end of the in-life portion to remove tumors, record tumor weight and document digitally. Tissues are then submersed in RNAlater, nucleic acids isolated, snap frozen or prepared for histology.